Shorewood Glen is an active adult community in Chicago's southwest suburb, Shorewood. Just two miles from both I-55 and I-80 this 765-home gated community offers all the luxuries of 55+ living. 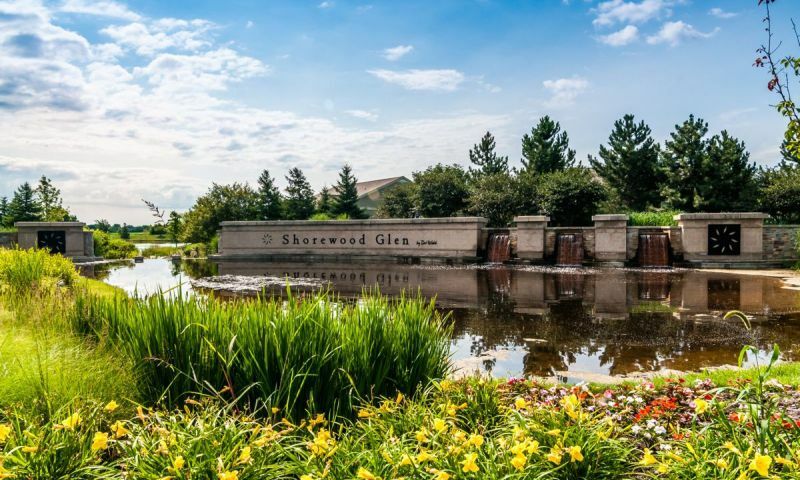 A magnificent clubhouse, inexpensive ranch homes and an active lifestyle have made Shorewood Glen one of the hottest selling adult communities in the Chicago area. Del Webb's Shorewood Glen is conveniently located across the street from the developing Shorewood Towne Center. When complete, the Towne Center will offer great retail, dining and cultural attractions within walking distance of Shorewood Glen. But residents of Shorewood Glen don't have to travel far to get their fill of entertainment and activity. A community clubhouse offers great amenities and social activities every day of the year. The lifestyle in Del Webb Shorewood Glen is not the only attraction, many 55+ homebuyers in southwest Chicago have bypassed other active adult communities in favor of the newer and less expensive single-family and duplex homes offered in Shorewood Glen. Shorewood Glen offers a variety of world-class amenities uniquely crafted for today's active adult homebuyers. The Lakeview Lodge is a 17,000 square-foot clubhouse at the center of Shorewood Glen. Here residents of Shorewood Glen gather to meet their friends, mingle with neighbors or stay fit. A state-of-the-art fitness center includes cardiovascular equipment, free weights and machines. Adjacent to the fitness center is an indoor Senior Olympic sized lap pool and indoor spa. The zero entry pool is ideal for lap swimming, water aerobics and even water volleyball games. An aerobics studio hosts exciting exercise classes such as aerobics, dancing, yoga and pilates. A ballroom in Shorewood Glen's Lakeview Lodge is the perfect place for residents to gather for parties, dances or large group meetings. There is also billiards, an art and craft studio and relaxing sunroom. The Del Webb Shorewood Glen clubhouse overlooks an 18-acre fishing lake. The back patio of the clubhouse features an outdoor pool and sundeck that is a popular place on hot summer days. There are also bocce ball courts, tennis courts and miles of walking and biking trails that surround the Lakeview Lodge. Del Webb Shorewood Glen offers single-family homes and duplexes. Since opening in 2004, the homes in Shorewood Glen have been popular with 55+ homebuyers because they offer all of the latest new construction features at lower prices than some of the other nearby active adult communities in Chicago's southwest suburbs. The popular floor plans include open and airy great rooms, well-equipped kitchens and low-maintenance single-level living. There are numerous single-family floor plans that range from 1,269 to 2,450 square feet. All homes include at least two bedrooms, two bathrooms and a two-car garage. For buyers who prefer complete maintenance-free turnkey living, two duplex models are available at very reasonable prices. The duplex homes are 1,285 and 1,547 square feet. Both include two bedrooms, two bathrooms and a two-car garage and the larger model also includes a den and dining room. There are many exciting clubs, activities and events for the residents of Shorewood Glen to participate in. The community activities director custom tailors a lifestyle that is designed around resident requests. Everyday an exciting calendar of events includes fun activities such as exercise classes, group meetings and day trips to places like the casino, art museums and downtown Chicago. There are dozens of clubs and interest groups in Shorewood Glen. Whether you prefer golf and tennis or cards and ceramics there is something for everyone here. The village of Shorewood is located adjacent to Joliet on the west side of I-55. Del Webb Shorewood Glen is located two miles west of I-55 along Route 52. Shorewood Glen's location makes it ideal for quick access to the highway. From the community, Midway Airport is accessible in approximately 30 minutes and nearby Naperville is just 20 to 30 minutes away. Residents enjoy close proximity to Joliet's attractions such as casinos, Chicagoland Speedway and the Rialto Square Theatre. Shopping is conveniently located within two miles from the community along Route 59. In addition, the developing Shorewood Towne Center across from Del Webb Shorewood Glen will feature a town hall, amphitheater and numerous dining and shopping outlets including a Kohl's retail store. Shorewood Glen is a wonderful 55+ community near Chicago that's close to everything. Lakeview Lodge - 17,000 Sq. Ft. There are plenty of activities available in Shorewood Glen. Here is a sample of some of the clubs, activities and classes offered here. The Manor Series single-family homes were unveiled in 2011. All Manor homes are built on a slab and offer exciting upgrades such as bay windows, extended garages and sunrooms. The Manors are ideal for homebuyers who want the privacy of a single-family home at a reasonable price. Association fees include lawn care, snow removal, landscaping and access to the amenities but homeowners are responsible for maintaining the exterior of their home. The Shorewood Glen Duplexes are designed for homebuyers who want the desirable Del Webb lifestyle at an affordable price. Each building includes one Franklin model and one Georgetown model. The duplexes were all built on a slab and include two bedrooms, two baths and a two-car garage. The neighborhood includes a total of 144 units completed between 2007 and 2011. Units are now available only as resale homes. The monthly association fees include all exterior building maintenance, lawn care, snow removal, landscaping and access to the amenities. The Americana Series includes four popular single-family homes built on 50' homesites. These homes are built on a slab but basements are optional. All plans include two bedrooms plus a den, two bathrooms and a two-car garage. Americana homes are available as both new construction and resale homes. Association fees include lawn care, snow removal, landscaping and access to the amenities but homeowners are responsible for maintaining the exterior of their home. The Classics Series offers three floor plans that range from 1,683 to 1,935 square feet in size. These homes offer two bedrooms, two bathrooms, and an attached two-car garage. The Heritage Series homes offer open space and elegance. Built on 70' homesites, these homes are renowned for spacious interiors and expansive great rooms. These plans all include two-car garages and the Hampshire model offers a three-car garage. The homes are built on slabs but basements are optional. Heritage Homes are available as both new construction and on a resale basis. Association fees include lawn care, snow removal, landscaping and access to the amenities but homeowners are responsible for maintaining the exterior of their home. The Premier Series offers the largest homes with just two bedrooms, two bathrooms, and an attached garage. These homes range from 2,631 to 2,412 square feet in size. Shorewood Glen is the best option for 55+ living in the southwest suburbs. The homes were built in the 2,000s so the floorplans are open, spacious and have large great rooms. The clubhouse is fantastic and everyone loves living here! This community is definitely the best value. Our realtor from 55places was so helpful. She was so patient & found us the best place. Our experience with Pulte Mortage was not stressful & we love our new home. I'm a single guy and wanted a simple place where I could just sit back and relax, no yard work, no maintenance. I really enjoy living here. The location is nice near all my old south side friends from back in the day. The clubhouse has lots to offer and my neighbors are really nice. 55places.com is not affiliated with the developer(s) or homeowners association of Shorewood Glen. The information you submit is distributed to a 55places.com Partner Agent, who is a licensed real estate agent. The information regarding Shorewood Glen has not been verified or approved by the developer or homeowners association. Please verify all information prior to purchasing. 55places.com is not responsible for any errors regarding the information displayed on this website.